This Tel Aviv couple was among the very many people, in Israel as all over the world, touched last week by the plight of Gaza and trying to do something about it – preparing personal aid packages, distributing leaflets at street corners and on university campuses, working feverishly deep into the night to take care of numerous logistical hitches in the preparations for the convoy, sending a stream of donations from all over the world, picketing Israeli embassies and convoys with signs reading “Let the Convoy Pass!”. In fact, a relief convoy had been in stages of preparation already for several weeks before these stirring events. The initiative started in late December, when Dr. Eyad al-Sarraj – the well-known Gazan< psychiatrist and human rights activist - got a permit to enter Israel. This provided a rare opportunity for him to meet with Israeli peace activists, hosted at the Gush Shalom office. He told at length about the increasingly desperate hardships of daily life in the Strip. It was quite unacceptable to hear all that and just nod our heads in sadness. On the spot, it was decided to organize a relief convoy for Gaza - providing both some real, concrete aid, and also a powerful symbolic gesture - and to struggle by all political and juridical means for the right to get the supplies into the Strip. Further, the arrival of the convoy at the border of the Strip would be marked by two parallel protest rallies, to be held simultaneously on the two sides of the impassable border. (At some stages in the preparations, it was proposed that the Israelis would stand on a hillside overlooking the Gaza Strip and the Palestinians come to a nearby field on their side of the border, so that denominators on both sides could see each other; this creative idea was foiled by the army declaring said hill "a closed military zone" and surrounding it with barbed wire). There were weeks of intensive preparations, meetings held every few days, adherence of more and more activists, endless phone calls and emailing, the drafting of manifestos and statements which were translated back and forth between Hebrew, Arabic and English, amended and amended again so as to satisfy all 26 of the peace groups which eventually joined the initiative – having considerable difference in political and ideological programs and, no less important, in the age and general outlook of their membership (the full list appears in the end). A single slogan was chosen, uniting everybody: "Gaza: End the Blockade!" On occasion, petty rivalries and quarrels flared up, sometimes acrimoniously – as they must in all human enterprises, however well-intentioned. Still, many activists from various organizations worked day and night, and new faces we had not seen before suddenly stepped in to take a heavy share of the burden. Gush Shalom started a fund-raising campaign among its sympathizers. Hundreds of checks came pouring in from Israel as well as a dozen other countries around the world, to cover the costs of the supplies. Often, words of thanks accompanied the checks for an opportunity to join the struggle. In consultation with Dr. al-Sarraj it was decided to buy, not only five tons of essential food-stuffs - flour, sugar, rice, oil, salt, beans and lentils - but also water filters. In the original meeting with him in Tel Aviv, one of the salient details was how polluted and undrinkable water is in the Gaza Strip, even in ‘ordinary’ times. The Israeli siege caused a very severe shortage of water filters – which are far from providing a full answer, but do at least reduce the danger to the drinkers’ health. So, the Israeli supplier was duly located in the town of Petach Tikva, and a quantity of filters purchased (we decided to concentrate on the heavy-duty large filters, costing 250 Dollars apiece, and destined for schools and other public institutions in the Strip). January 26, and the weather forecasts were far from auspicious: “Rain and thunderstorms all over the country, rainfall will increase during the day.” Already in the preceding night, we had been woken up by strong thunderbolts. "Who is going to get up early on Shabbat morning in such stormy weather, in order to participate in an open-air protest rally and carry sacks of food?" But a single look at any of the bustling rendezvous points (Nazareth, Haifa, Tel Aviv, Jerusalem, Be’er Sheba) was enough to dispel all such apprehensions. Under the drizzle, old and young activists were very busy - strapping boxes with supplies (well wrapped in nylon against the rain) to the roofs of cars, and attaching long black ribbons to radio aerials. As requested by the organizers, hundreds of families came in their private cars, all of which were soon decorated by posters showing a map of Gaza surrounded by barbed wire, and the slogan “End the blockade!” in three languages. Some added on their own cars older placards and posters left over from earlier campaigns: “Gaza: Stop the madness, stop the war!”, “No to Occupation, Yes to Israeli-Palestinian Peace!”, “It won’t end - until we talk!”. A battered old car, full of youngsters with weird hairstyles, was completely covered with graffiti: “One More Car Against the Siege”, “You have gas? Gazans Don't!”. Together with those travelling by bus, the number of participants reached about two thousand – far above expectations. It was the veteran Ya'akov Manor who had come up with the idea of asking demonstrators to bring private relief parcels and to add personal letters "from family to family". This touched a chord among activists who had seen the distressing TV broadcasts from Gaza. Families spent considerable care and expense in preparing their personal aid packages, bringing not only food and mineral water, but also blankets, warm clothing and many other useful articles, even stoves. Parcels were fastened to the tops of the cars or put in the baggage holds of the buses. When later collected together, they amounted to no less than an additional two tons of supplies. At the assembly the rain was slight, no real hindrance. But during the drive southwards to the Erez Border Crossing it grew heavier and heavier, pouring down, making it almost impossible to see the road, and considerably slowing down the numerous cars. Enough to make the most obdurate of atheists utter a fervent prayer, precisely the opposite of what peasants in this land have prayed for since time immemorial “No rain! No rain! Please, please, can you not stop it for two hours! Just two hours, that is all I ask!” A call from the Reuters TV camera crew: “We are positioned at Erez and waiting for you. All set to start world-wide live broadcast at 12.45 sharp. Please be punctual – these satellite links cost a lost of money, you know”. A hasty cellphone consultation from car to car, and the organizers' resolve: “We must make it, by hook or by crook, even if we all get soaking wet. We just CAN’T afford to miss that broadcast!” Dr. Sarraj, calling from the preparations for the Palestinian parallel rally in Gaza, with a ray of hope: “Don’t worry, the rain in Gaza has stopped and the clouds are clearing away. We are all under the same sky, whatever the barriers on the ground!” And so it proved. By the time the convoys from all over the country converged on the Yad Mordechai Junction and set out for the final few kilometres, there were only large puddles on the ground to remind of the fury of the elements. The sun broke out to give camera crews a full chance to capture the long long, slow moving line of cars, buses and trucks. Disembarkation at the locked gates of the Erez Checkpoint – once a crowded thoroughfare, where tens of thousands of Gazan workers passed very early every morning on their way to low-paid jobs in Israel, now a concrete wasteland which only “exceptional humanitarian cases” are granted the rare privilege of traversing. Jewish and Arab demonstrators – about half and half, with a leavening of Swedes, Germans, Americans, Canadians, Japanese and a single Korean – held aloft aid packages and placards, marching along the high walls separating the Strip from Israel. From the loud-speaker atop a van chants were initiated in Hebrew and Arabic, enthusiastically picked up by the marchers: “Gaza, Gaza, don’t despair – we will end the occupation yet!”/”Gazans deserve Freedom, Gaza will be Free!”/”Peace – Yes! Occupation – No! Peace – Yes! Siege – No!” / “Occupation is Terrorism, The Refuser is a Hero!”. Mounted police shadowed the march, and a cordon of police and soldiers was stretched along the Wall. Ahead, the truck loaded with sacks of flour was already waiting, covered with heavy tarpaulins against the weather – to be used as an improvised speakers' podium. A phone call from Dr. Sarraj, from the rally of the Palestinian-International Campaign to End the Siege at the Unknown Soldier's Tomb in Gaza City, magnified by loudspeaker for the waiting crowd: "I am proud and honoured to be addressing you today, this is a significant date in the history of the region. Maybe the siege and collective punishment are a blessing in disguise, when they brought us together, Palestinians and Jews, Israelis and Arabs, united in the pursuit of peace - of security for Gaza and Israel, for Ramallah and Sderot!" Prolonged applause, and a reciprocal message of peace by the undersigned relayed in the same way to the Palestinian rally. It was even possible to faintly hear the cheering of the Gazan crowd. On more than one past occasion, attempts at such phone-relayed speeches ended with embarrassing scenes of loud squeaking and inarticulate noises. But recent improvement in cellphone technology have evidently come to the rescue of cross-border peace activism… “What shall we say to the hungry child and his mother, seeking bread in the streets of Gaza – we who stand helpless at the locked gate? What shall we say to all the children trapped in this terrible ghetto, to the stillborns dying in their incubators because the state of the Jews has cut off their oxygen? And what can we say to ourselves?” cried out Nurit Peled-Elhanan, whose own daughter was killed in a Jerusalem suicide bombing ten years ago. “Three days ago, the Rafah Wall has fallen, as the Berlin Wall has fallen, as the ‘Separation Wall’ cutting through the West Bank will also fall. 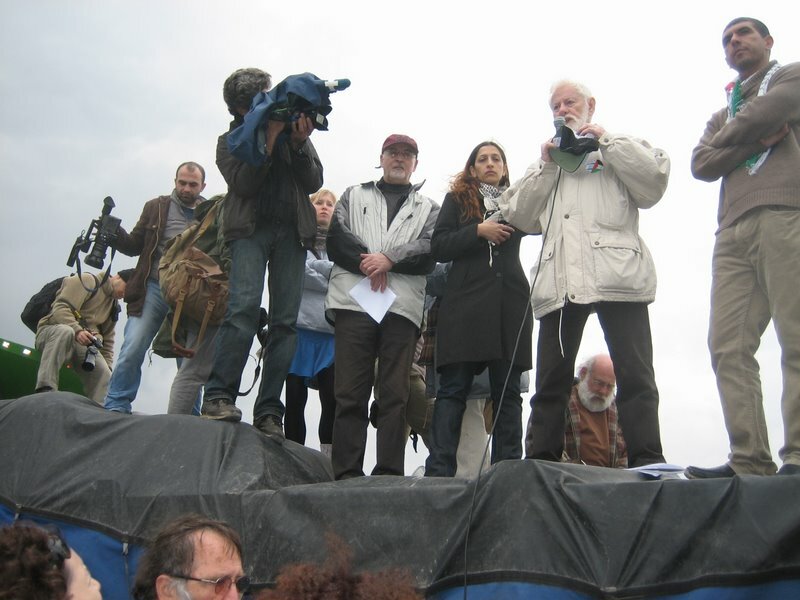 But our government and our army still continue, in our names, a monstrous policy of siege and denial of vital supplies to the inhabitants of Gaza” said Uri Avnery. “Our hearts are with our brothers and sisters in Gaza, who demonstrate at this very moment on the other side, with our brothers and sisters in Sderot who live under the threat of the Qussam missiles. This threat will not be removed by siege or military retaliation, ‘an eye for an eye’ will only make us all blind. There is only one way and one solution for ending the Qussams: to sit down and talk – yes, talk to the Hamas! Talk about a full ceasefire. No more Qassams from Gaza to Israel, and no deadly raids and incursions of Israel into Gaza, no more mortar bombs and no more aerial ‘liquidations’. A full ceasefire on the way to full peace with all parts of the Palestinian people!” Advocate Fatmeh al-Ijou spoke of last week’s hearing at the Supreme Court in Jerusalem. “The state had enough temerity and cynicism to assert that the cutting off of electricity and fuel to Gaza is legal under International Law, as being ‘similar to the international economic boycott against Apartheid South Africa’. As if there is anyone in the world who does not know who is implementing Apartheid methods in the Middle East, which country it is which constructs roads where permission to drive is dependant on the motorist's ethnic origin!” “Together with us and with our friends in Gaza, tens of thousands of people are standing at this moment in demonstrations and pickets and rallies all over the world, in capital cities and megalopolises as well as in small towns – all of them demanding the end of the siege on Gaza and of the occupation in general.” said Professor Jeff Halper, who went on to call upon the people of Sderot to rebel against the role imposed on them by the government – “The role of hostages to missile fire and pretexts for acts of oppression in Gaza, which only serve to provoke further shooting of missiles". [A list of places where demos took place appears in the end]. “As soon as the spotlight went out on the visit of President George W. Bush [a loud “Boo”! from the audience], the light also went out in the homes and hospitals of Gaza” called former Hadash MK Issam Makhoul. “But the years of silence are over. Jewish and Arab people of peace and goodwill are uniting in the struggle for a just peace, which alone can ensure the future of the children of Gaza and Sderot”. And Balad Mk Jamal Zahalka added: “The so-called negotiations and Peace Process which the government announced are empty of any real content, a mere camouflage to hide the crimes committed in Gaza. What the government tries to hide from the public is the basic fact that numerous offers of a ceasefire were made by the Palestinian side and were all rejected out of hand by the Government of Israel”. Teddy Katz read out a message from former Minister Shulamit Aloni, a scheduled speaker who could not come for health reasons: “Enough of the killing, murder and destruction, committed in our name! Enough of false propaganda, media spins which end in death! This is my direct message to the Minister of Defence, Ehud Barak, and his henchmen: The time is over for your mentality of reckless, unthinking commando raids and assassinations. The time has come for maturity and rational consideration – a time for peace!” (Aside from her words, Aloni provided a substantial monetary donation and two personal aid packages.) A completely unexpected speaker, who came up at the last moment, was a young woman from Sderot, Shir Shusdig - who climbed the truck/ podium with some diffidence and took the microphone: "For the past seven years, at Sderot and Kibbutz Zikim, I have lived under the constant threat of the Qassams. I have become so attuned to them that even in other, quiet parts of the country, when I hear a public address system I immediately think this is the missile alarm. I know that the people on the other side are also suffering very much. I don’t trust either our government or the Hamas to solve the problem and bring peace. But, the fact that we have come here, so many people together, Jews and Arabs and Palestinians over there, that is what gives hope; that we all want peace!” (very loud cheers). At the end, the personal parcels were loaded on a smaller truck. Since the army is far from already allowing them into the Gaza Strip, the personal packages, together with the sacks of flour and rice and the precious water filters, were all taken to a warehouse placed at our disposal by Kibbutz Kerem Shalom - conveniently located where the borders of Gaza, Israel and Egypt meet. Getting them into the Strip will require a lot of negotiations, lobbying and possibly an appeal to the Supreme Court – as we knew in advance. You will soon hear more about it. (A few minutes after protesters piled into the cars and buses, the rain started again. ) ========================================================= Social TV video of the convoy (Hebrew text, but you can see the action) http://www.tv.social.org.il/medini/stv-gaza-relief-convoy-26-1-08.htm if it does'nt work well, try instead: http://www.practivism.co.il/video/stv/stv-gaza-relief-convoy-26-1-08-new.wmv List of participating organizations: Gush Shalom, Combatants for Peace, Coalition of Women for Peace, ICAHD – The Israeli Committee Against House Demolitions, Bat Shalom, Bat Tzafon for Peace and Equality, Balad, Hadash, Adalah, Tarabut- Hithabrut, Physicians for Human Rights – Israel, AIC – The Alternative Information Center, Psychoactive – Mental Health Workers for Human Rights, ActiveStills, The Students Coalition (Tel Aviv University), New Profile, MachsomWatch, PCATI – The Public Committee Against Torture in Israel, Yesh Gvul, Gisha, Local Television on the Internet, Committee for Israeli-Palestinian Dialogue, “On the Left Side”, Faculty for Palestinian-Israeli Peace (Israel). Website of the Palestinian organisers: http://www.end-gaza-siege.ps/IndexEn.htm List of places where parallel demonstrations took place on this international day against the blocade of Gaza: U.S.A. New York, Phoenix, Seattle, San Diego, Chicago, Cleveland, Boston, Philadelphia, San Francisco, Anaheim, Los Angeles, Chicago, Washington DC, Boston, Alameda, Detroit, Chapel Hill, Durham, Champaign, Anaheim, Charlotte, Costa Mesa, Sioux Falls, St. Paul, New Haven U.K London, Birmingham, Brighton, Leicester, Manchester, Edinburgh, Swansea, Sheffield, Edinburgh, Glasgow SPAIN Madrid, Malaga, Cordoba, Barcelona, Valencia, Santander, Torrelavega, Celra (Girona), Lerida, Asturies, Mallorca ITALY Rome, Modena, Bologna, Grosseto, Naples, Milan, Padova Como Udine, Torino FRANCE Paris, Poitiers, Toulouse, Strasbourg, Bordeaux, Nantes, Orleans, CANADA Montreal, Sydney, Toronto, Melbourne GERMANY Berlin, Gelsenkirchen, Gothenburg, Koblenz, Wuppertal SWEDEN Stockholm, Gotaplatsen AUSTRIA Vienna SOUTH AFRICA Cape Town - and in other places which may have escaped our attention - often with a considerable participation of Jewish groups opposed to the policies of the Government of Israel. Dit bericht werd geplaatst in Palestina/Israël en getagd Jeff Halper, Keller door Anja . Bookmark de permalink .